This is my system. If you’re after the most complete no-nonsense course to beat roulette, this is it. I don’t mean techniques that work only in theory, but real and legitimate techniques that are literally being used to win millions in today’s casinos. This is also one of my products (Steve). 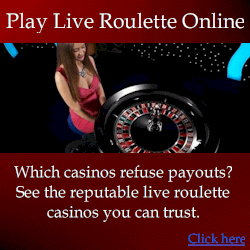 To those that know me well, I am considered the world’s foremost expert in roulette prediction. Unfortunately, malicious competitors have published many fake negative reviews and entire web sites dedicated to discrediting me (also see genuine winneroulette system). The best way to describe my roulette strategy is a collection of every proven technique to beat roulette, plus something entirely new. It is not just one technique I teach. The techniques can and indeed have won millions, and there is real record of it. I have publicly demonstrated my methods numerous times to large audiences. Videos of some of my public demonstrations will be published in the near future. The techniques known by casinos include various types of visual ballistics, dealer signature analysis and even bias analysis, so I offer everything Laurence Scott (Visual Ballistics), Pierre Basieux and Susanne (Power Roulette) offer, plus a lot more. So it is a fact that at the very least, my methods are as accurate as the other legitimate systems. But conduct further research and you’ll understand that my methods are by far the most powerful in modern casino conditions. 1. Visual Ballistics Techniques: visually determining the location and deceleration of the ball and wheel to predict where the ball will most likely come to rest. You receive a variety of visual ballistic methods including the crossover method and simplified versions. 2. Dealer Signature Tracking: analysis and utilization of wheel and ball release speeds by individual dealers. 3. Bias Analysis: chi-squared and standard deviation testing to exploit physical flaws of roulette wheels. 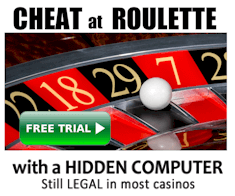 I’ll teach you how to exploit numerous forms of little-known bias on modern wheels before even the casino themselves knows about it – even if they have bias analysis software of their own. 4. Primordial Variants: multiple versions of a simplified spin analysis method. 5. Custom Variants: Custom variants are a method to combine the edge obtained from all other legitimate techniques to give you the highest edge possible. In other words, you use various pattern types and techniques together to give you an enormous edge. In addition to the techniques specified above, custom variants incorporate 9 different pattern types that casinos do not yet know about. Because they take advantage of a combination of techniques and patterns to create an “overall edge”, custom variants are considerably more effective than any “singular” method. Some elements of custom variants are known to other professionals, but most are not. Custom variants are essentially charts that tell players exactly when and where to bet. As such, they are usually considerably easier to apply – easy enough even for a child. To receive a custom variant (betting charts), players enter spin data into the software, which analyzes the data and generates convenient betting charts that tell players when and where to bet for optimal edge. I am looking forward to hearing from you and learning more about the “player only online custom variant software”.